Giovanni Francesco Barbieri, called il Guercino or simply Guercino, meaning “The Squinter”, a nickname referring to a congenital eye condition from which he suffered. 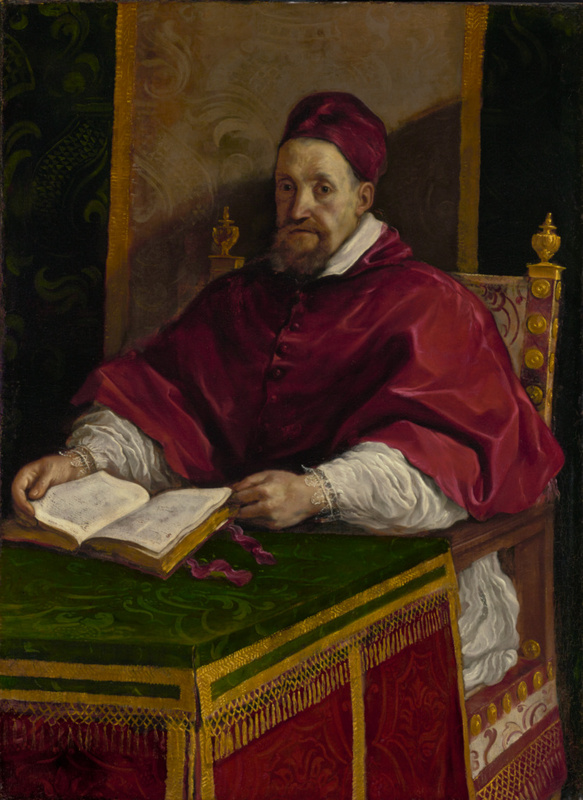 In 1621, Guercino was called to Rome from his hometown of Cento, Ferrara, to paint this portrait of Pope Gregory XV (1554–1623). Despite being a largely self-taught artist, Guercino quickly rose to fame in north Italy and was patronized by cardinals and noblemen, before receiving this commission from the Curia. Though using a format that had become standard for papal portraiture since the Renaissance, the artist deviates from tradition by placing less emphasis on the trappings of power and more on his subject's character. Shown with a weary stare and a sickly pallor, this portrait captures the pope at the end of his life, worn by the cares of office and failing health. Pope Gregory XV, Italian, 1554 - 1623 (Rome, Italy), possibly commissioned from the artist, about 1622/1623; by inheritance within the Ludovisi family, 1623. Source: Possibly the same as no. 245[b] in the 1633 inventory of Cardinal Ludovico Ludovisi (nephew of Gregory XV): "Un Ritratto della s.m. di Greg.o XVo cornice dorata, et intagliata alta pmi sei." William Ward, first earl of Dudley, 1817 - 1885 (Witley Court, Hereford and Worcester, England), by inheritance to William Humble, 1885. Ralph Cross Johnson, 1843 - 1923 (Washington, DC), donated to the the National Gallery of Art, Smithsonian Institution (renamed the National Collection of Fine Arts, and in 1980, the National Museum of American Art), 1919. National Museum of American Art, Smithsonian Institution (Washington, DC), sold to the J. Paul Getty Museum, 1987. Malvasia, Carlo Cesare. Felsina Pittrice: Vite de Pittori Bolognesi. Vol. 2 (Bologna: 1678), p. 365. Calvi, Jacopo Alessandro. Notizie della vita, e delle opere del cavaliere Giovan Francesco Barbieri detto Il Guercino da Cento celebre pittore : alla sacra maestà di Napoleone il Grande, Imperatore de' Francesi, re d'Italia, e protettore della confederazione del Reno. (Bologna: Tipografia Marsigli, 1808), pp. 16-17. Malvasia, Carlo Cesare. Felsina Pittrice: Vite de Pittori Bolognesi. Giampetro Zanotti, ed. (1678; repr., Bologna: 1841), p. 260. Waagen, Gustav Friedrich. Treasures of Art in Great Britian: Being an Account of the Chief Collections of Paintings, Drawings, Sculptures, Illuminated Mss., &c., &c. 3 vols. (London: John Murray, 1854), vol. 2, p. 236. Catalogue of the Art Treasures of the United Kingdom, Collected at Manchester in 1857, exh. cat. (London: Bradbury and Evans, 1857), p. 36, no. 363. Bürger, W. [Théodore Thoré]. Trésors d'art en Angleterre. (Brussels and Ostende: 1860), p. 104. Atti, Gaetano. Intorno alla vita e alle opere di Gianfrancesco Barbieri detto il Guercino da Cento. (Rome: 1861), p. 133. Exhibition of the Works of the Old Masters [...], exh. cat. (London: Royal Academy of Arts, with William Clowes & Sons, 1871), p. 33, no. 374 (as "Portrait of a Cardinal" by Titian). Christie, Manson & Woods, London. Important Pictures by Old Masters, from the collection of the late Earl of Dudley. June 16, 1900, p. 8, lot 30. Carter, J.P. New York American. (16 November 1908). Graves, Algernon. A Century of Loan Exhibitions, 1813-1912. 5 vols. (London: Algernon Graves, 1913-15), vol. 1 (1913), vol. 1, p. 457, vol. 3, p. 1321. "The Ralph Cross Johnson Collection: National Gallery of Art, Washington, D.C." The American Magazine of Art 2, no. 10. (August 1920); no. 14. (December 1920), p. 346. United States National Museum. Report on...the United States National Museum of the year ending June 30, 1919. (Washinton: 1920), pp. 23-24, 149. Rose, George B. "The Ralph Cross Johnson Collection in the National Gallery of Art." Art and Archaeology, vol. 10, no. 3. (September 1920), pp. 79, 87, 91, ill.; reprinted in Smithsonian Institute Report (1920), pp. 679-690, ill. Pl. 5; again reprinted, 1922. "Notable Pictures in Washington". The Christian Science Monitor. (Boston: 26 October 1921). Holmes, William H. Catalogue of the Collections in the National Gallery of Art. (Washington, D.C.: 1922), p. 58, no. 21, ill. facing p. 64; reprinted 1926, p. 69, no. 21, ill. facing p. 62. Mechlin, Leila. "A Home for the National Gallery of Art." Daughters of the American Revolution, vol. 58, no. 7. (July 1924), p. 426, ill.
Mechlin, Leila. Washington Star. (August 7, 1928). Hess, Jacob, ed. Die Künstlerbiographien von Giovanni Battista Passeri (Leipzig: Verlag Heinrich Keller; Wien: Verlag Anton Schroll & Co., 1934), p. 355. Smithsonian Institution, National Collection of Fine Arts, Preliminary Catalogue Listing Paintings, Drawings and Sculpture. Checklist. (1963), p. 92. Smithsonian Institute Annual Report. (1963), p. 188. Taylor, Joshua C. National Collection of Fine Arts: Smithsonian Institution. (Washington D.C.: Smithsonian Institution Press, 1978), p. 18. Mahon, Denis. "Guercino as a Portraitist and his 'Pope Gregory XV." Apollo, vol. 113. (April 1981), pp. 230-35. Spike, John T. Baroque Portraiture in Italy. exh. cat. (Sarasota: Ringling Museum, 1984-85), p. 94, no. 26, ill.
Smyth, Frances P., et al, eds. The Age of Correggio and the Carracci: Emilian Painting in the Sixteenth and Seventeenth Centuries, exh. cat. (Washington, D.C.: National Gallery of Art, 1986), pp. 442, 471-73, no. 165, ill.
Nell'età di Correggio e dei Carracci : Pittura in Emilia dei secoli XVI e XVII, exh. cat. (Bologna: Pinacoteca Nazionale, 1986), pp. 442, 471-73, no. 165, ill.
Lewis, Jo Ann. "Guercino to the Getty." The Washington Post, April 2, 1987. "Principales acquisitions des musées en 1987." La chronique des arts: Supplément à la Gazette des beaux-arts, 6th ser., 111, no. 1430 (March 1988), p. 33, no. 193, ill. "Acquisitions/1987." The J. Paul Getty Museum Journal 16 (1988), p. 161, no. 30. Salerno, Luigi and Denis Mahon. I Dipinti del Guercino. (Rome: Ugo Bozzi, 1988), pp. 173 (n. 91), 212. Lombardi, Lidia. "Quel dipinto del Guercino che rivoluzionò un museo." Il Tempo, December 7, 1991. Dal Soglio, Pubblio. "Guercino tra ispirazione e accademia." Città nuova, November 10, 1991. Mahon, Denis, ed. Giovanni Francesco Barbieri : Il Guercino 1591-1666, exh. cat. (Bologna: Museo Civico Archeologico, 1991), pp. 160-63, no. 56, ill.
Jaffé, David. Summary Catalogue of European Paintings in the J. Paul Getty Museum (Los Angeles: J. Paul Getty Museum, 1997), p. 58, ill.
Brown, Beverly Louise. "The Birth of the Baroque: Painting in Rome 1592-1623." in The Genius of Rome 1592-1623, exh. cat. (London: Royal Academy of Arts, 2001), pp. 37-38, 379, cat. no. 9, ill. The J. Paul Getty Museum Handbook of the Collections. 6th ed. (Los Angeles: J. Paul Getty Museum, 2001), p. 105, ill.
A Private Passion for Renaissance: Important Furniture and Sculpture. Sotheby's sale, London, October 29, 2003, lot 44, p. 91. The J. Paul Getty Museum Handbook of the Collections. 7th ed. (Los Angeles: J. Paul Getty Museum, 2007), p. 103, ill.
Schaefer, Scott. "The Bolognese Baroque in Los Angeles and Southern California." In Captured Emotions: Baroque Painting in Bologna, 1575-1725, exh. cat. Andreas Henning and Scott Schaefer, eds. (Los Angeles: J. Paul Getty Museum, 2008), pp. 44, 112, pl. 14. Schaefer, Scott. "Bolognese Painters and the Problem of Portraiture." In Captured Emotions: Baroque Painting in Bologna, 1575-1725, exh. cat. Andreas Henning and Scott Schaefer, eds. (Los Angeles: J. Paul Getty Museum, 2008), pp. 39, 44, pl. 14. Turner, Nicholas. The Paintings of Guercino: A Revised and Expanded Catalogue raisonné (Rome: Ugo Bozzi Editore, 2017), pp. 158, 159, ill., 230, 258, 379, 397, 413.